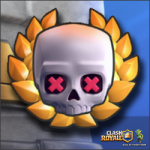 2v2 challenge: win deck and tips | Clash Royale fan-site! 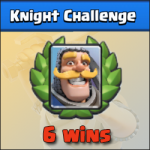 Home » BLOG » 2v2 challenge: win deck and tips. 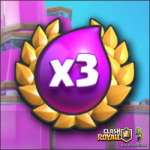 The next special challenge has started this weekend in Clash Royale! 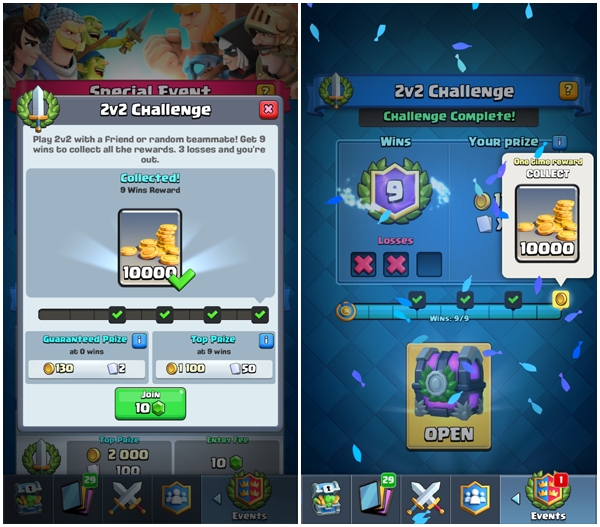 This time this is 2v2 challenge, the reward for successful passing of which consists of 13,100 of gold (total amount for the rewards for determined quantity of wins, quest and victory chest) and 75 cards (20 rares, 5 epics and 50 from victory chest). In this 2v2 challenge, the level of cards reduces to the tournament standard (like in all challenges in Clash Royale) and this makes 2v2 gameplay more attractive! 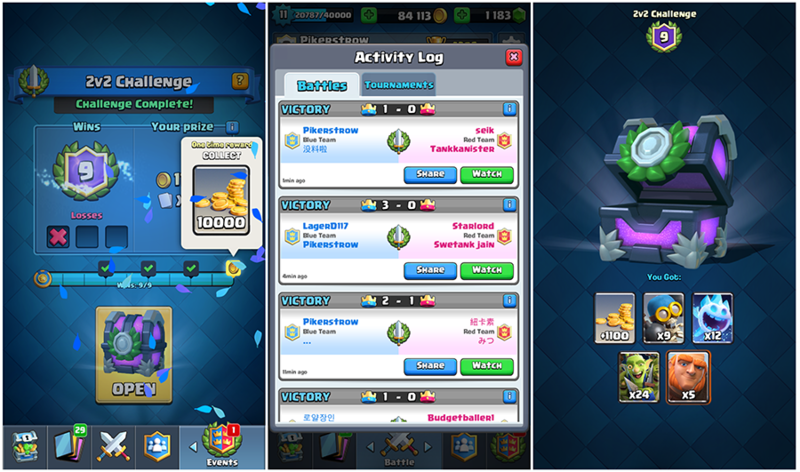 In this post, I’ll share my deck and write a few tactic tips, which helped me to get 9 wins (in both my accounts) with random teammates and win this challenge! Form your deck for 2v2 in such way that it consists troops/spells (or their combinations), which can eliminate group of troops (or in other words, area damage troops or spells). Such troops allow to get advantage in elixir, what is the main key to the victory! 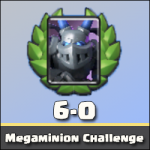 In my deck, I used the next area damage troops and spells: Mega Knight, Executioner, Tornado, Poison (see picture below). Do not hurry! Try to coordinate actions with your teammate as much as possible. For example, don’t deploy cards immediately after battle start because different mobile devices has different RAM memory and, as a consequence, battle can start with some delay in some types of devices… The best way to coordinate actions with teammate is to hold chosen card above the selected spot for card deploying. In case, if your teammate isn’t a noob he will understand and support you. Another way is to watch your teammate moves and try to support him. In any case, good coordination of actions in 2v2 battles is another key to the victory! Try to remember your teammate deck (if he is not your clan mate) at the early beginning of the battle. Knowing it and watching his moves, you can roughly calculate what he has in reserve and plan own moves… For example, your teammate has Giant in his deck and you have Balloon in own… Therefore, the most reasonable way to use Balloon is to wait until teammate deployed his Giant, etc. The main idea of this deck is quick counterattacks with the help of Miner, Goblin Gang and Poison after repulsing of opponents push. Mega Knight is more defensive troop than attacking one! Deploy him in defense only! Such deploying allows to destroy group of enemy troops simultaneously and start own counterattack. 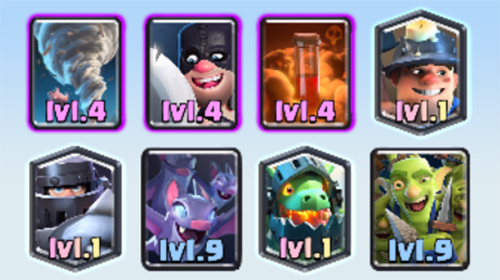 Executioner and Tornado is another powerful defending combination in this deck! Therefore, try to hold on this pair for defending, especially if opponents use some tank with swarms for it covers (or such units as Witch and Night Witch). That’s all! Hope this post will help you to build own good deck for 2 v 2 challenge and win it!